Bon Echo Provincial Park is located in southeastern Ontario and is situated along several lakes, including Mazinaw Lake – the seventh deepest lake in the province. For years we’ve been saying we’d like to visit Bon Echo, in large part because it’s located close by K’s family cabin. So this year we finally made it happen. While there are just over 500 car camping sites to choose from in this provincial park, we booked one of the 25 coveted canoe-in campsites located in the backcountry on Joe Perry Lake. We left Toronto late after work and spent the night at “The Cabin“. While this rustic gem has no running water and no electricity, it is nestled in nearly 100 acres of untamed forest bordering onto a lake. The property has been in K’s family since the early 1900s. We arrived at the cabin at around 11:30p.m. Or rather we arrived at the entrance of the road leading up to the cabin. A few years ago we cracked the skirt of a car navigating down this particularly dicey hill on the drive in so now we just walk-in (this is why we can’t have nice things). It’s a relatively short hike, maybe about a kilometre or so. No big deal. We spent the morning lounging around the cabin. We built a fire despite the fact that it was close to 30°C outside. We just couldn’t help ourselves. After an early lunch we walked back to our car and headed over to Bon Echo Provincial Park. It was about a 15 minute drive or so to get from the cabin to the park entrance. We checked in, picked up some firewood, and headed over to the canoe rental area in the main part of the park. We took a couple of life jackets and paddles and then headed over to the entrance of Joe Perry Lake. Our canoe was already waiting for us down by the water. It’s about a 500m hike from the parking lot to the lake. We made two trips because we bought a bag of firewood and a bag of kindling. No regrets. There’s a dock at the entrance of the lake to help load and launch your canoe into the water. Joe Perry Lake is surprisingly pretty big and the campsites are pretty spread out. 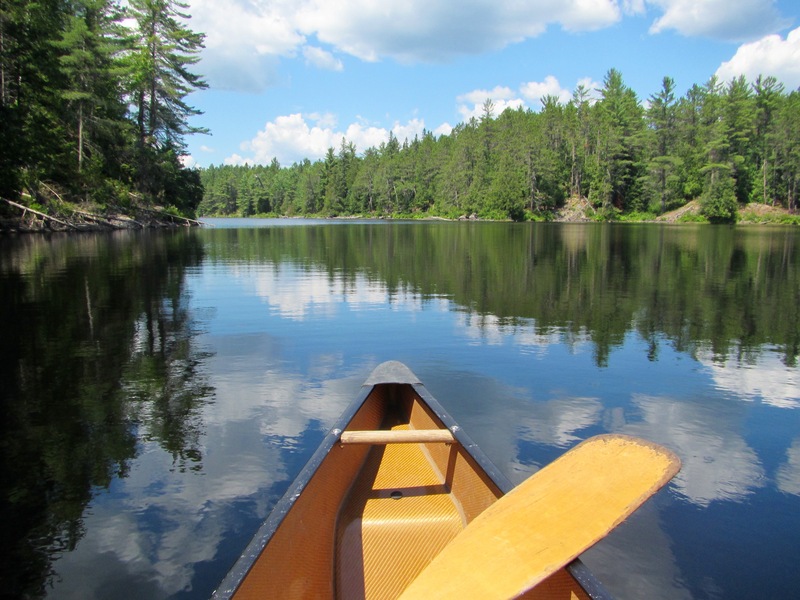 There are actually 22 canoe-in campsites on Joe Perry Lake and 3 additional campsites on Pearson Lake. It was a relatively short paddle to get to our campsite, maybe about 20 minutes or so. Our campsite came complete with a picnic table, fire pit, and thunder box (i.e. toilet). We unloaded our canoes and packs and set up our camp for the night. Afterwards we went for a swim. The shore right off our campsite was rocky, but slopes down pretty quickly. We prefer this than swimming in weedy shallows. The water was refreshing. Maybe a little too refreshing. But that’s probably because we forgot our towels. Once we dried off we went for a canoe ride to check out Pearson Lake. There are actually two routes to get to this lake: the first was near the boat launching area and requires a 100m portage (pass) and the second requires having to navigate through this marshy narrow channel. When the water is low it may not be possible to get through. Even when the water is not low navigation is still a bit tricky. Stakes have been scattered throughout the channel to ease with navigation. Follow these closely otherwise it’s super easy to get stuck in a pile of floating mud and lily pads. The sun was starting to set by the time we returned to our campsite. We heated up some chile for dinner and got the fire started. The fire was more for the source of light than it was for the warmth. We woke up to another beautiful (but hot and humid) day. We fried up some eggs for breakfast and made a small fire to burn the remainder of our wood (and garbage). We then packed away our tent and gear into our canoe. On our way back to the dock, we made a detour at the beach area and were pleasantly surprised to find a rather nice sandy and shallow beach. We left our canoe at the boat launch area (thankfully no portaging required) and this time were able to take our packs and gear all in one trip to the car. We then headed back to the main canoe rental area in the lagoon off Mazinaw Lake. The nice thing about renting a canoe here is that we were also able to use one to canoe around Mazinaw Lake. So we did just that. We canoed across the other side of the lake (probably a 5 minute paddle) to another dock that marks the trailhead to the Cliff Top Trail (1.5km roundtrip. It was a little dicey getting out on the dock, but we managed to without jumping into the water. We tied our canoe to the dock and started the 100m climb up the escarpment. There are three scenic overlooks located on top of the cliffs that provide sweeping views of the shoreline of Bon Echo Provincial Park. We returned our paddles and lifejackets once we made it back to the lagoon. We then headed over to the beach area to make some lunch at one of the shaded picnic tables before heading back to the city. Well Bon Echo, what can we say? Making a detour here was well worth it. Our only regret was not visiting sooner. We’ll be back. Looks like a provincial park we would enjoy! For sure. There’s a nice variety of activities in Bon Echo Provincial Park: swimming, hiking, canoeing, camping (both front-and backcountry), fishing, and climbing. What more could you ask for in a park? This looks absolutely amazing! Thank you so much for sharing! Can’t go wrong here. Swimming, hiking, camping and canoeing what more could one need. Does it really have a bon écho? In theory. Regrettably we did not test it. Looks like an awesome park. I have never been camping at a site that required water access, have always wanted to go, looks like a lot of fun. It most certainly is. The campsite we booked at Bon Echo was a relatively short paddle from the shore, so it wasn’t particularly strenuous or anything. Canoe-in campsites are generally more secluded and quiet compared to regular front-country campsites. Plus you get more of that authentic experience of being surrounded by just nature. Car camping is definitely more convenient and preferable when the weather is terrible, but there’s something nice to be said about being able to physically put some distance (and water) between you and the rest of the world sometimes. You should definitely give it a try! Wow, beautiful! I’ve always wondered what the lake-filled portion of Ontario is like (I’ve never been past Tobermory). This looks relaxing and so peaceful. Thanks for adding a new place to my “to visit” list! (I’m probably biased, but) Ontario is filled with many hidden gems like Bon Echo. Glad it peaked your interest. If (when) you do visit, we highly recommend booking one of the canoe-in campsites. These are such beautiful lakes and landscapes! I love a good fire and wouldn’t be able to resist either, even in warm weather. For sure. It’s not often that we get an opportunity to make a campfire, so I’ll take that I can get … even if it’s sweltering hot outside. Awww why thank-you! As a fellow vegetarian and traveller I appreciate your travel tips, tricks, and adventures as well. Happy travels! Never stop exploring.